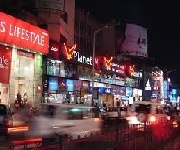 Brigade Road is one of the biggest commercial centres and busiest shopping areas of Bangalore. It is also a connecting road between the M G Road and Residency Road in the city. Also called – ‘Street Capital’ of Bangalore. Very known for shopping centres and retail outlets of international brands. 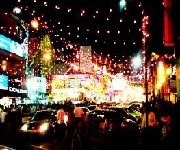 Popularly known for its New Year celebration hub in the city for many years. It has many shops,restaurants, pubs and other happening places. 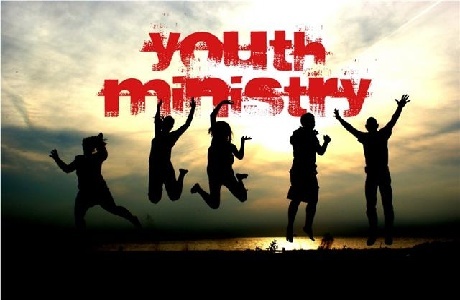 Certainly a must visit – weekend evenings are the best. Mahatma Gandhi Road also known as M.G. Road is a road in Bangalore, India. M. G. Road is also one of the busiest roads in the city and is lined on one side with retail stores, food outlets and restaurants. Metro Rail is one of huge crowd puller to this road. It has many office buildings, shops and theatres. It is also a home to a large number of buildings and banks. 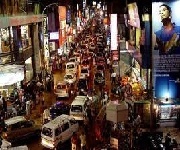 Another busiest streets in bangalore, totally buzzing with people around flocking into shopping malls. 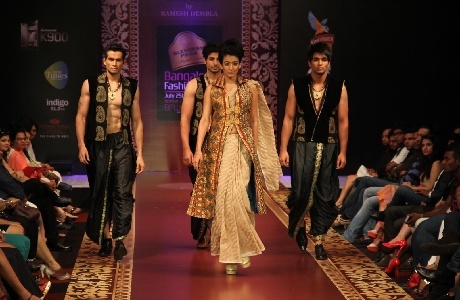 Known for its trend setting styles across bangalore which originates here. Hot Galebi’s from Bhagat Ram’s should be on your must have list when here. 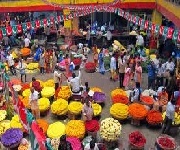 Russell Market is a famous shopping market in Shivajinagar. It was started in 1927 by Britishers and was inaugurated in 1933. It is named of the then municipal commissioner T. B. Russell. 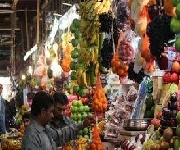 Wide variety or we could prominently say – all types of fruits, vegetables, meat, flowers, knick-knacks, homewares are sold here, including imports. Chickpet is one of the oldest shopping areas in Bangalore with a history dating back nearly 400 years and this area is still bustling with energy and vigor. Best known for sari shops across the entire street. It’s one of the most famous wholesellers/retailer hubs known to bangalore. Have little patience & you will certainly find what you want to buy coz it is so thickly populated & its wholesome business at every nuke & corner of these roads. 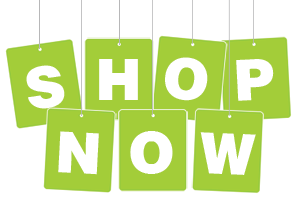 Dobbspet - Books & stationary, BVK iyengar road – All Electrical & lightings, Raja Market – Gold & Silver, Cubbonpete – Chemicals & Dyes for cloths & Vegitable markets. 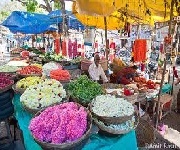 This is also one of the oldest market city known to bangalore. 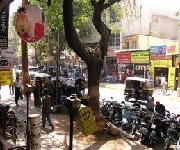 Alankar Plaza which is one of the first malls of Bangalore is located here. It’s one the hearts of Theater/movie operations. 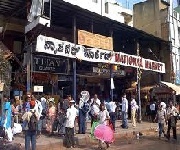 National Market is definately a must visit – to check out imported goods sold from most parts of the world. Rampant piracy may seem shocking though yet dont worry. UB City is the biggest commercial property project in Bangalore. 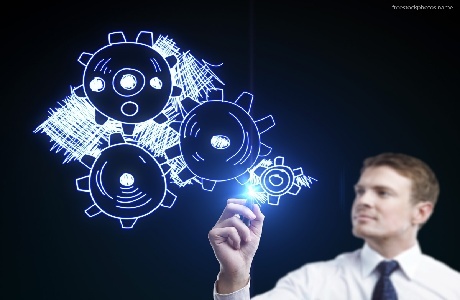 Pioneered by the chairman of UB Group – Dr.Vijay Mallya, in Joint Venture with Prestige Group. 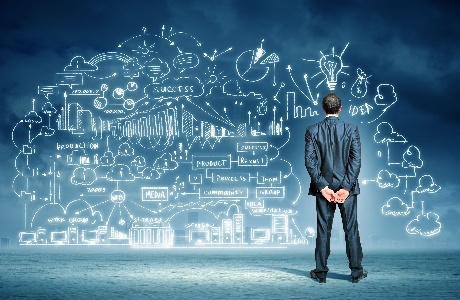 It is built on 13 acres of land and hosts 1,000,000 sq ft of high-end commercial, retail and service apartment space. 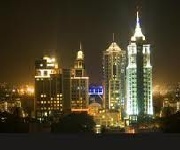 UB City has four towers namely, UB Tower (19 Floors), Comet (11 Floors), Canberra (17 Floors) and Concorde (19 Floors). Bangaloreans will fully agree that Malleshwaram is one cultural capital of bangalore with all its raw nativity & creative stuff it presents to visitors. The huge Malleswaram Circle, the horses in the jataka stand, the fragrance of the bouquet shop, shoppers at 8th Cross and the temples – all this give Sampige Road a typical south Indian look and feel. This is one of the oldest localities of Bangalore.The name Basavanagudi means “Bull Temple”. It’s named after the Nandi temple on Bull Temple Road. This is the place you need to visit if you are craving to have the best IDLI’s and Dosas here in Bangalore. Vidyarthi Bhawan(Gandhi Bazaar), Chaat Street(V.V.puram), MTR (Lalbagh Road). Best time to visit is during festive season.